Aloe vera is a desert plant, belonging to the lily family. It grows well in dry soils and is native to East and South Africa. A perennial and succulent plant, it has sharp, fleshy leaves, serrated by white spikes. 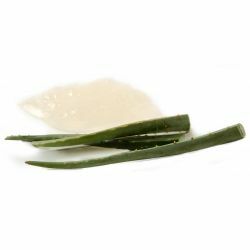 The outer leaf encases a clear gel, harvested for its healing properties. Aloe is thought to be one of the oldest known healing remedies, noted for its healing qualities in Egyptian, Roman, Chinese, Greek, Italian, Algerian, Moroccan, Arabian, Indian and Christian history. Cleopatra is known to have massaged it into her skin, and it appears in Anglo Saxon medical texts, having been brought to Europe in the 10th Century. More recently, the healing qualities of aloe have been found to be more effective than any other substance in the treatment of radiation burns. It is obtained from inside the leaves and freeze-dried to form a powder. We reconstitute this powder to a gel of its original strength with water. This gel is a very effective ingredient for cooling and soothing the skin. It is particularly good in after sun products. The skin is cooled and redness fades away. Our Breath of Fresh Air toner, Cosmetic Lad, Skin’s Shangri La, Enzymion and Skin Drink facial moisturisers all contain organic aloe vera gel to soothe and cool the skin. The Joy of Jelly shower jelly contains organic aloe vera gel, which combines with the carrageenan extract to care for the skin.